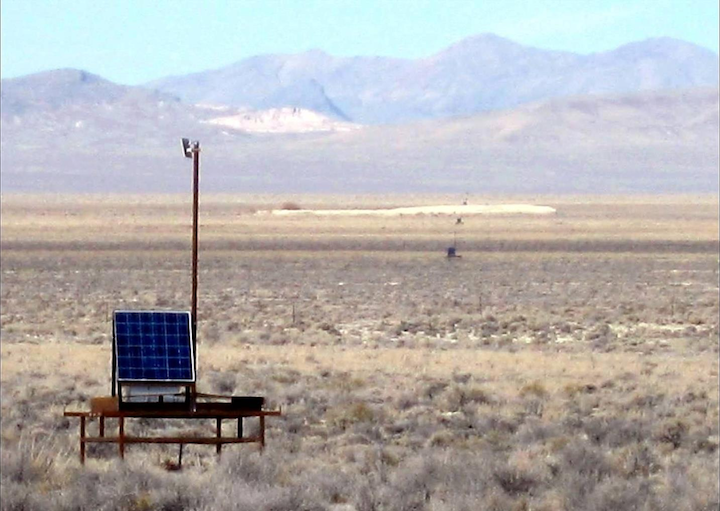 A Telescope Array Surface Detector and its neighbors, deployed in Utah’s west desert. The 507 detectors are arranged on a grid covering 700 square kilometers, about the same as the land area of New York City. The researchers brought in lightning experts from the Langmuir Laboratory for Atmospheric Research at New Mexico Techto help study the lightning in more detail. They installed a nine-station Lightning Mapping Array developed by the group, which produces 3-D images of radio-frequency radiation that lightning emits inside a storm. In 2014, they installed an additional instrument in the center of the array, called a “slow antenna,” that records changes in the storm’s electric charge caused by the lightning discharge. The bright flash of light is only one stage of lightning; there’s a substructure that happens too fast for the eye to see. “Step leaders” proceed toward the ground in stages. Negative electric charge builds at the leader tip until it is sufficient to cause the air to break down and form a new conducting path. The study found that terrestrial gamma rays are produced within the first 1-2 milliseconds of the initial breakdown stage, which is the least understood part of lightning. PHOTO CREDIT: Animation by John Belz, LMA data courtesy of Langmuir Laboratory, New Mexico Tech. An animation of cloud-to-cloud lightning (the circles) as detected by the Lightning Mapping Array (LMA) over the Telescope Array Surface Detectors (red squares). The color represents time – earliest LMA sources are in blue, and the latest in red. The entire event takes about one tenth of a second. The LMA is sensitive to what is happening thousands of meters above the ground.